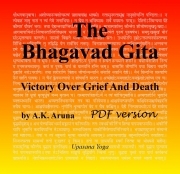 Description of "The Bhagavad Gita, as PDF and ePub (eBook)"
This special format of the English translation of the Bhagavad Gita presents a way to quickly read the intended meanings of the entire text in three or four sittings. This is facilitated in part by removing the Devanagari of the text and any word-for-word meanings. Those are more than amply supplied by referring to the author’s Aruna Sanskrit Series in which the Bhagavad Gita is thoroughly analyzed down to the grammar of the verses and the roots of the words employed. The Sanskrit language condensed verse formation requires an expert elaboration that is succinct enough to not drag out the reading of the text, missing the big, integrated picture for the minutia. This is uniquely done here by employing a bold font to distinguish the original words of the Bhagavad Gita from the embedded introductions and explanations in normal font. Additionally, a unique index is provided to locate the important terms, concepts, and topics. For some reason many Indian authors give no index in their publications of the Bhagavad Gita. The uniqueness here is that the index is not to page numbers, but rather to chapter.verse numbers. This allows the index here to be applicable and very useful to any other translation of the Bhagavad Gita that you have relied upon but lacked an index. Reviews of "The Bhagavad Gita, as PDF and ePub (eBook)"